Peterborough’s MPs voted differently as Theresa May’s Brexit deal suffered another defeat this afternoon in the House of Commons. On the day the UK was originally scheduled to the leave the European Union MPs voted against the Withdrawal Agreement by 344 votes to 286. Those voting against the agreement included MP for Peterborough Fiona Onasanya, but North West Cambridgeshire MP Shailesh Vara voted for it “with reluctance” as he described it as the “least bad choice to deliver on the referendum result”. The defeat means the UK is now due to leave the bloc on April 12 after being granted an extension to Article 50. That extension would have been until May 22 if the deal had been passed. MPs were voting on the Withdrawal Agreement – the document outlining how the UK’s exit from the EU would work – and not the Political Declaration, which outlines the future relationship between the two. Two previous votes on both the Withdrawal Agreement and Political Declaration were comprehensively rejected by MPs, including both Ms Onasanya and Mr Vara. If the Withdrawal Agreement had been approved the Prime Minister had promised to step down before the next stage of negotiations. MPs held indicative votes on a number of potential Brexit options on Wednesday having seized control of the parliamentary timetable. None of the eight options received a majority, but it is expected MPs will hold more indicative votes on Monday. Even if one option does receive a majority the result will not be binding on the Government. Speaking before the vote, Mr Vara said: “The Withdrawal Agreement remains a bad deal, but with Parliament now being run by Remainer MPs there is a real danger that we could end up with an even worse deal or no Brexit at all. 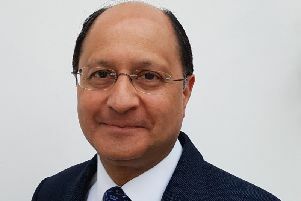 Mr Vara resigned as Northern Ireland minister in opposition to the deal. In recent months he has called for the UK to leave the EU without a deal rather than back the one negotiated by Mrs May. Independent MP Ms Onasanya tweeted that she was not supporting the deal as “nothing has changed”. A recall petition which could see Ms Onasanya lose her seat is currently running in Peterborough after she was jailed for perverting the course of justice. If 10 per cent of her constituents (nearly 7,000 people) sign it by 5pm on May 1 a by-election will be triggered. Grantham & Stamford MP Nick Boles, Huntingdon MP Jonathan Djanogly, Brexit Secretary and MP for North East Cambridgeshire Steve Barclay, South Holland and The Deepings MP John Hayes and Corby MP Tom Pursglove all voted for the deal.